You’re so close to perfection! Covers such vocabulary topics as Science, Finances, Art and many more. Hundreds of Spanish verbs, nouns and adjectives in Spanish vocabulary flashcards to achieve Spanish C1 and get to advanced level quickly and with ease. Become advanced in the native language of over 400 million people all over the world. Spanish vocabulary flashcards will help you get Spanish C1 with lists of vocabulary by topics from relationships to social problems and arts. Hundreds of Spanish words in one course to achieve advanced level Spanish and use Spanish language freely. 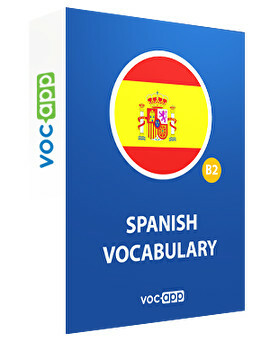 Study Spanish C1 vocabulary with VocApp and memorize Spanish nouns and verbs forever. The course includes hundreds of Spanish vocabulary flashcards divided into lists of vocabulary topics for easy navigation and fast learning. Advanced Spanish vocabulary is a quick way to achieve Spanish level C1 and become a proficient user. Learn Spanish words and get ready for an upcoming trip or DELE exam .